I won’t be serving tea and coffee for a while until I have found a better way to do it – the layout of the shop (mainly that the kitchen is upstairs) makes it problematic. Apologies if anyone was hoping for tea today. I can only deal with the books at the moment, an overwhelming task. Confirmation that the bookshop will be closed today (Friday 23rd), as I have a medical appointment and there is no one to hold the fort. We will be open again on Saturday. It is likely that the wiring for speakers and projection equipment will be done by the end of next week; I just need to find a projector either that we can borrow for a while or that we can buy inexpensively and then we will be able to start showing films in the evenings. The shop has a new window graphic – it still has the Job Centre sign to confuse everyone, but in due course I hope to cover that up or replace it with a Tree House one. Here is a photo taken by a friend when the window graphic had just been installed – click on it to make it bigger. I think it looks wonderful. One little girl looked at it and said, ‘Oh, there’s a picture of a tree and a girl praying to it!’ I like the idea of confusing reading with praying to a tree. I apologise for closing the shop from time to time – it’s been a bumpy opening ride, and until I find someone else to help me run the project (assuming that I do…), it will continue to need a level of flexibility in terms of some of the practicalities. Don’t worry, I won’t post daily updates forever, but just to say that I will open the shop again today, for as long as I can. Tomorrow I have to go to the doctor, so will open if and when I can. Tomorrow’s planned story time for children has been cancelled. A day at a time. Still looking for a long-term solution. I will be in the shop today, hopefully from 10am though I may be late, and will stay open as long as I can. I won’t be offering tea and coffee, I am afraid, as I need to focus on sorting other things out, and the layout of the shop makes the serving of hot drinks tricky. It’s a compromise, but I’ll never forgive myself if I don’t keep trying. I need to get books on shelves – the right books on shelves – and that is the priority. I am still hoping to find someone to take it over, or at least to come in as a business partner (no money in it yet), as I have realised I simply can’t run it on my own. I have some excellent help, but need daily help of various kinds if the venture is to succeed. Thank you for supportive messages, on top of all the other support I’ve received over the weeks. I’ve been listening to the pre-release of the new record in the bootleg series from Bob Dylan, hence the strength to take another step. I am sorry, I have fallen apart somewhat, and don’t feel able to proceed with the Tree House at the moment. I am hoping to find someone who might want to take it on. I will try to do what I can, but I have never felt like this about anything before, and am not sure if and when I can open it again. Thank you so much to everyone who has supported it. If I do find I really can’t continue, I will find a way to pay back those who have invested money. I will also make sure the books are forwarded to appropriate homes. I am not quite giving up yet, but it’s hard to see a way forward. It – or my inability to cope with the pressures of it – is helping to destroy precious friendships, and that in itself is too much to bear. From this week, the Tree House Bookshop will only open four days a week rather than five. This is not in any way an indication that things are not going well – they are going brilliantly! It’s to do entirely with my own need to earn a living and the fact that I’m struggling to do that and keep the shop open for five days – I am not expecting to earn any income from the shop for a while, and I have two part-time jobs that help to keep me afloat in terms of paying the rent and bills and keeping me in whisky. So for the next five weeks at least, possibly a couple of months, the bookshop will open Wednesday to Saturday, 10am to 5pm. If I am able to be there on a Tuesday, I will open up, as I also open a bit early if I’m there and ready to open before 10am. Any passing trade we attract obviously helps! In time I hope we will open six or even seven days a week, but for now I have to be practical, and preferably stay sane! A few more music events are being planned, and am working on getting a projector so that we can show films once or twice a week, and also have some literary and other ideas in the pipeline. I also now have a few people who are keen to help with developing the events side of the bookshop, so we will be getting together and seeing what we come up with. Once the university term starts again, I hope to encourage students to use the shop as a venue for their many creative talents. So lots of things that I hope will help to establish the shop beyond being a bookshop; I’m also beginning to make some progress with sorting through the many, many boxes of books that have been donated so that we can make the stock on the shelves as interesting and tempting as it can be! 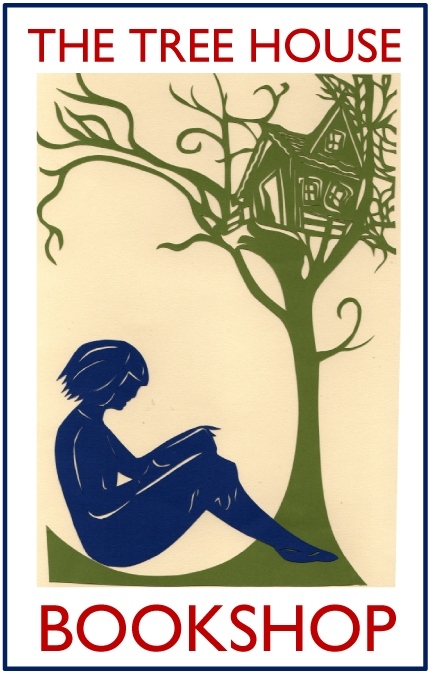 Thank you so much to all those who have supported the Tree House in any way at all – the first three weeks since we opened have been amazing, in terms of both book sales and events, and also in terms of the general response I have received from those who have come into the shop. We now have tea and coffee on offer (the coffee is straightforward – no frothy milk, no powdered chocolate, just coffee, but it’s freshly ground in the shop, and we have some herbal teas as well as ‘normal’ tea). This coming Friday (23 August) we have our first Story Time for children at 11am (all very welcome!). We are still finding our feet, and there are bound to be a few alterations to things as we do so, but I hope to keep these to a minimum. I wouldn’t close the shop on Tuesdays unless I really felt it was necessary – and it should only be temporary until other things are resolved, or until I get enough people who can cover my absences from the shop. It’s all good! We had a truly outstanding gig at the Tree House on Friday night. 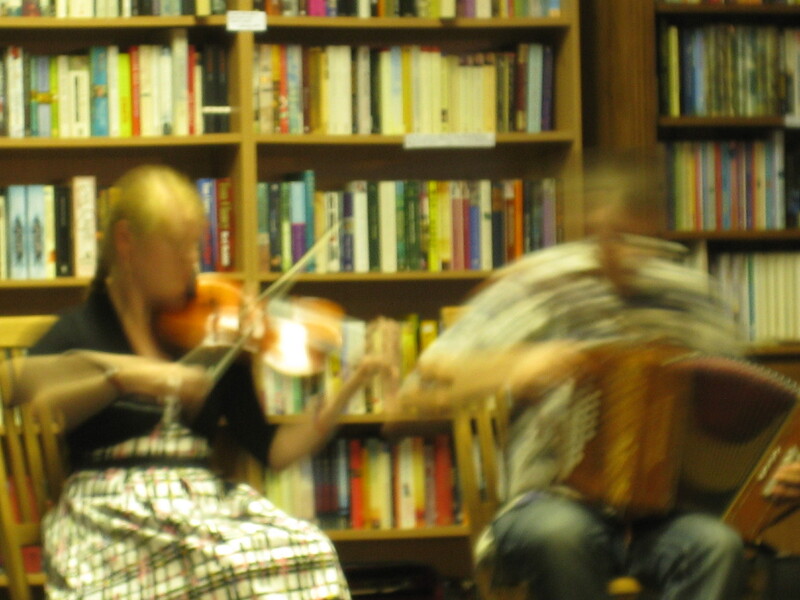 Folk duo Haddo (husband and wife Will and Nicky Pound) were just fabulous. 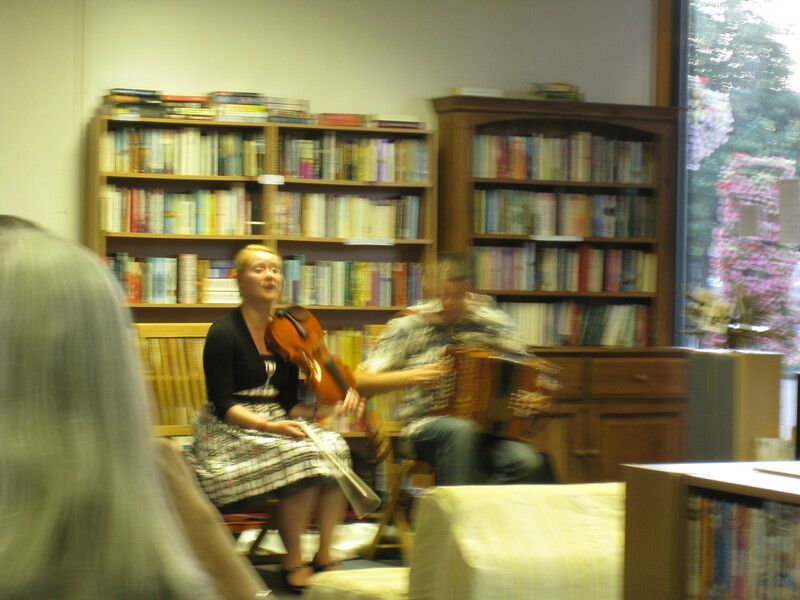 Two wonderful musicians and very lovely, engaging people – it was such a pleasure to host this event. And as if their usual stuff wasn’t good enough, they played some new material for the first time and even gave first outing to a new departure for them – they usually play instrumental music, but Nicky has decided she will sometimes sing as well, so we had the first ever public performance of Nicky singing with Haddo. A premiere for the Tree House Bookshop! I failed to get decent photographs, being at the back and still not knowing, after several years, how to use my camera properly, but I quite like the blurry effects! They give something of the dynamism of live performance (that’s my excuse and I’m sticking to it!). So a great night, thank you to everyone who came, and I do hope we will have Haddo back in the future for those who weren’t able to make it. Recordings do no justice to the power and sheer pleasure of the live performance.